Minestra maritata means “wedding soup,” and this gluten free version is a true marriage of greens and gluten free meatball soup. Bound with rice and prune puree instead of bread and egg, these meatballs are on the delicate side but come packed with flavor. If you can’t find ground chicken thighs, ground turkey leg is a good alternative (avoid ground chicken breast—it’s too lean). If using a blender to puree the prunes, you may want to make a double batch: Extra puree is great in place of butter or oil in baking and stores airtight up to 2 months in the refrigerator. Make the meatballs: Soak the prunes in hot water for 10 minutes. Drain, reserving a few tablespoons of the soaking liquid and all of the prunes. In a food processor or blender, puree the prunes, adding 1 tablespoon at a time of the soaking water, until mostly smooth. Oil a large plate. In a large bowl, thoroughly mix together the chicken, rice, prune puree, parsley, garlic, salt, fennel, oregano, and pepper. Oil your hands to make it easier to shape the sticky meatballs, reapplying oil as needed. Gently form 12 balls and transfer to the prepared plate. Make the soup: In a wide, heavy 6-quart saucepan or pot over medium heat, warm the olive oil. Add the celery, garlic, bay leaf, and red pepper flakes. Cook, covered and stirring occasionally, until the garlic starts to turn golden, about 2 minutes. Stir in the kale and cabbage and season with salt. Continue to cook the greens, stirring often, until wilted, about 3 minutes. Add the broth and 3 cups water and bring to a boil. Lower the heat and simmer until the greens are tender, about 10 minutes. To prevent the meatballs from sticking together, add them to the soup one by one. Bring the soup to a boil, lower the heat to medium-low, and gently simmer, carefully stirring occasionally, until the meatballs are cooked all the way through and the rice is al dente, about 35 minutes. Remove from the heat, cover completely, and let sit so the rice can finish cooking, about 20 minutes. 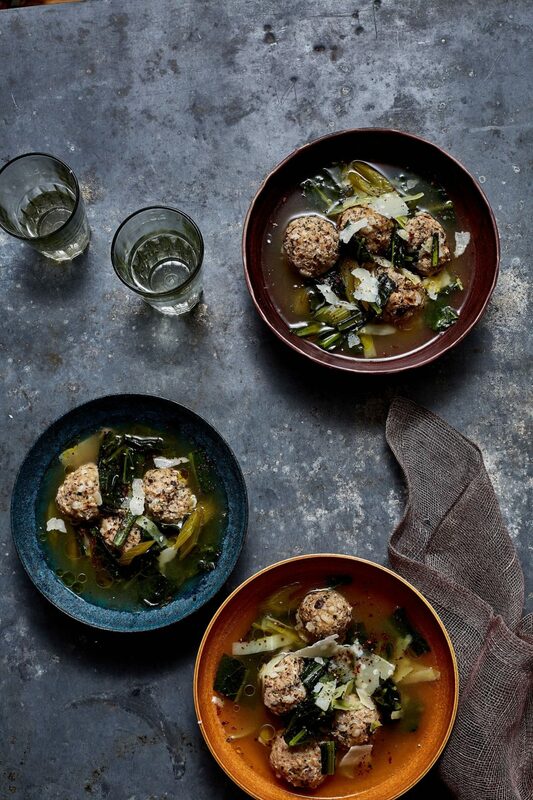 To serve, reheat the soup to simmering, then ladle into 4 bowls with 3 meatballs each and drizzle with olive oil. With a vegetable peeler, shave Parmesan curls over each bowl, and serve with lemon wedges on the side.